Blank screen when the Customizer is first loaded looks broken, and nothing happening visually when following a link in the preview or when a change requires the refresh transport that takes a while looks odd. Let's make more liberal use of loading indicators and/or semi-transparent overlays. 31196.patch​ (2.4 KB) - added by Fab1en 4 years ago. 31196.2.diff​ (2.9 KB) - added by westonruter 4 years ago. 31196.3.patch​ (2.8 KB) - added by Fab1en 4 years ago. 31196.translation.patch​ (1.9 KB) - added by Fab1en 4 years ago. Patch to apply on top of [attachment 31196.3.patch] for loading message translation. 31196.4.patch​ (4.2 KB) - added by Fab1en 4 years ago. 31196.5.patch​ (3.1 KB) - added by Fab1en 4 years ago. 31196.6.patch​ (3.1 KB) - added by westonruter 4 years ago. 31196.7.diff​ (3.8 KB) - added by westonruter 4 years ago. 31196.8.diff​ (4.1 KB) - added by westonruter 4 years ago. So there should be a loading indicator when the preview first loads, when the preview refreshes, and when navigating to another URL. The result is that the contents of the Customizer preview fade to 0.25 opacity, a progress cursor appears along with a “Loading…” tooltip, and finally clicking is disabled on the preview until the page refreshes. Again, this is only addressing the UX issues when navigating around the site in the preview. As an aside: transactions (#30937) will improve the loading experience since the iframe would be populated with the natural URL (#30028) as opposed to fetching the contents via Ajax and then document.write'ing them: the browser's normal loading indicators would appear. If we could get a patch here, it would be good for 4.2 consideration. Here is a patch that puts @westonruter code in. I will try to extend it to also address refresh transport loading time. I added the loading spinner when a control with refresh transport is triggering a preview reload in 31196.3.patch​. I also renamed the unload event to loading. One thing is still missing : "Loading" message translation. Is it OK to introduce a new JS l10n global var to handle this in customize-preview.js ? This ticket was mentioned in ​Slack in #core-customize by drew. ​View the logs. Yes, you are right. I was looking for that settings variable without finding it. In 31196.6.patch​, use better class name wp-customizer-unloading and add CSS transitions. If you click on a linked image (href=src of image) the Customizer does a POST request to the image which produces a 405 Method not allowed error. Reproduced in 3.8 as well. But the issue is, that the loading overlay will remain on an error. In 31196.7.diff​, send a message to the preview when a failure occurs to load a URL, and remove the loading indicator when this happens. 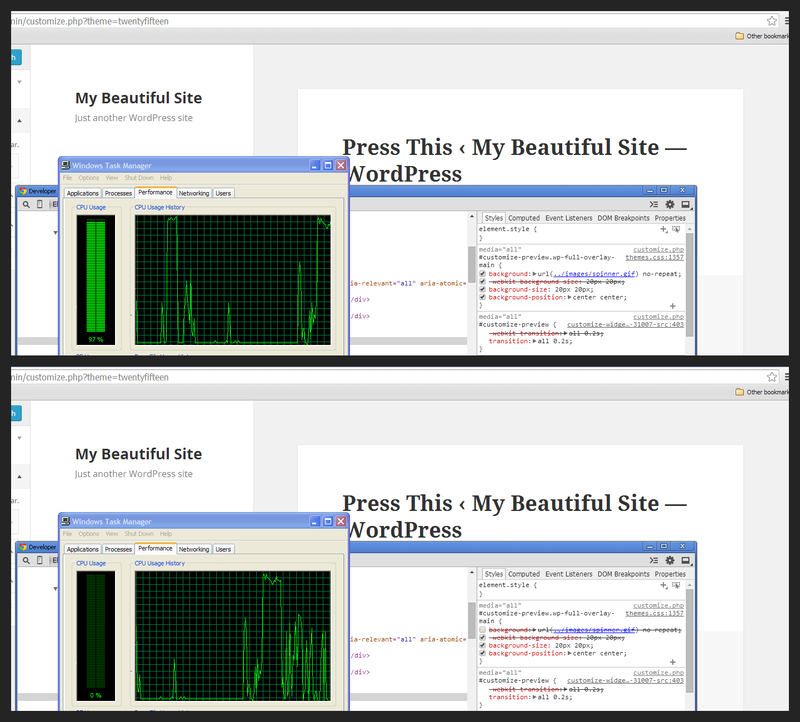 The loading indicator added by /wp-admin/css/themes.css makes the Customizer unusable in IE11. The opening and closing of sections seems unaffected by the transitioned opacity in the preview. Need to resolve the performance issues here if we're going to make the fast-approaching enhancements deadline. Changing keyword from has-patch to needs-patch due to IE11 issue. I put the call for help out on #core. In 31196.8.diff​: Remove hidden background image when iframe loads to help with performance. Customizer: Add loading indicators for the Customizer preview.